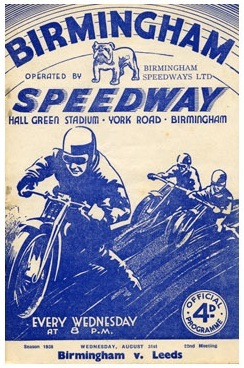 Speedway is known to have taken place in at least 8 different venues spread across Birmingham. The first meeting took place at the Alexander Stadium, Perry Barr on 12th July 1928 in front of a crowd in excess of 6000. 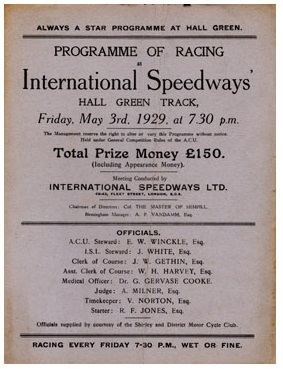 It was a popular venue in that first year, with 12 meetings being held, but it was to be a further 18 years before this area winessed further speedway. 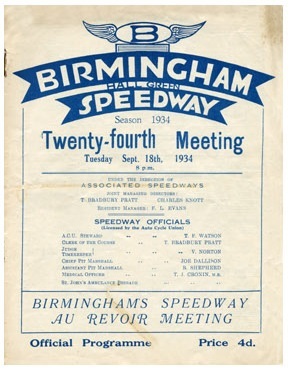 It was not until 1946 that speedway was to return when Burmingham were successful against the Norwich Stars by 56-48. The final meeting at this venue took place on 23rd September 1960 when London were successful by 49-41. The team have been League Champions in 1974 and 1975 and also won the Knockout Cup in 1974. 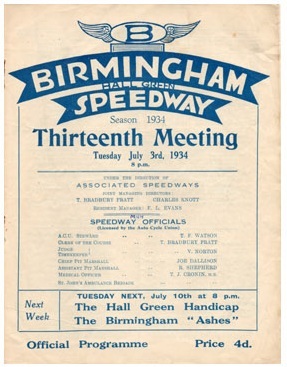 Greyhound racing has taken place in Birmingham, notably Hall Green and Perry Barr, since 1932. 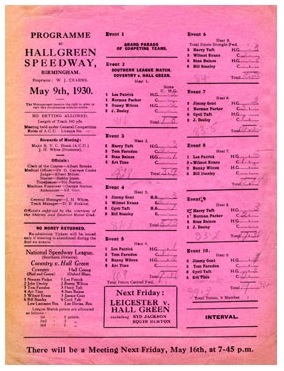 Hall Green hosts the Midland Flat championship over 474 metres and a number of greyhounds from the track have triumphed in the Greyhound Derby, notably those trained in the 1980's by Geoff De Mulder. 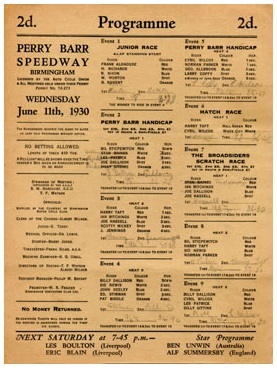 Perry Barr dates even further back with a meeting held in April 1928. 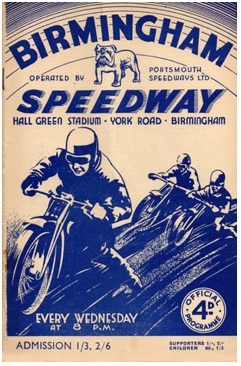 Its principal race is the Birminham Cup which has been run since 1939. The club is well known as The Brummies, but has also been nicknamed the Bulldogs and The Blues in the 1930's. The Birmingham Brummies currently (2019) contest the SGB Championship. Recent successes include the Premier League Pairs title in 2009, the Premier League Fours in 2010, the National League Trophy in 2016, and the National League Title in 2015 and 2016.